Are you looking for rear-mounted ATV attachments? Currently, we offer a cultivator and a disc. To utilize these implements, you’ll need to attach them to our hydraulic-powered category “0” 3 Point Hitch. This quad attachment is an investment that will grow with possibilities as we continue to design, engineer, and manufacture new implements to complement the Wild Hare ATV Implement System. Fully load your ATV with front and rear attachments and you will be the talk of your neighborhood…and buddies. Make anything possible. Our hydraulic ATV accessories add fuel to the firepower of your ATV. Talk about testosterone! The high powered hydraulic pump used for our ATV attachments has been upgraded since the original conception of the product. We have upgraded our hydraulic system so that it is easier, more robust and has an increased performance life. Our hydraulic kit comes with mounting brackets, so that it stays secure while you’re hard at work. Bolt the kit to the back rack of your ATV and it’ll stay stable and within reach at all times. Our hydraulic system also comes with hydraulic hose quick connects that take just seconds to attach and detach from the implements being used. We recommend a quad with 400 cc’s minimum for all our hydraulic attachments/implements. Manual: Once the 3 point hitch is mounted to the back of your ATV, the center link can be lengthened and shortened by a simple twist. This makes attaching the implements stress free and very fast. 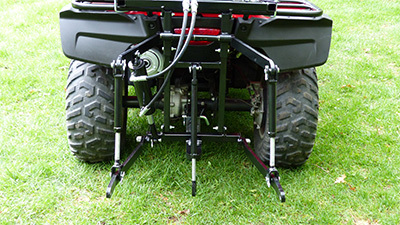 Hydraulic: After the 3 point hitch and/or implements are bolted and secured, you can move the implements up and down with a single finger via a rocker switch mounted on the handlebar of your ATV. The power of our hydraulic pump and quality of our attachments can raise the tires of your ATV off the ground and safely lift 300 lbs. 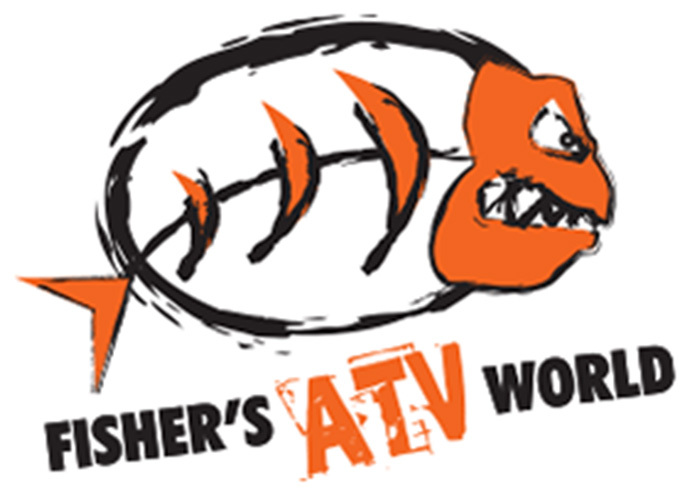 We are setting the new standard for quality ATV accessories. Don’t eat dirt – move it, haul it and control it with Wild Hare Manufacturing’s long lasting and highly capable hydraulic quad accessories. Fully equip your ATV with front and rear attachments that can work simultaneously. A simple valve handle diverts hydraulic fluid from the front bucket tilt control to the 3 Point Rear Category “0” Hitch in the back, while still being able to raise and lower the front loader. Or just utilize our rear mounting attachments by selecting the hydraulic 3 point hitch and the cultivator/disc implement. We give you the power and quality. The application is up to you. Contact Wild Hare Manufacturing for any product questions at info@wildharemfg.com or call 218-483-1000. © Copyright 2019 Wild Hare Manufacturing, Inc. All Rights Reserved.